Presair air actuated foot pedals are shockproof, explosion-proof and waterproof. The pneumatic foot pedals contains an internal air bellow. When pressed, it sends a pulse of air through a tube to an air switch. Action may be momentary, alternate or sequencing. 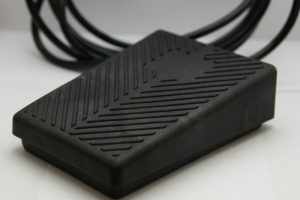 Presair also supplies electric foot pedals, which are a low profile option providing high performance at a low cost. Many push button actuator options available for purchase. Give us a call and our direct customer service will be happy to help, 715-831-6353. View more push button air actuators and air bellow product details or purchase our standard options in our online store by clicking below. Made of glass-filled polypropylene. Standard black, with other colors available. Custom logo available. B621BA Rectangular shape 1/4″ O.D. B721BA Clam shell shape 1/4″ O.D. 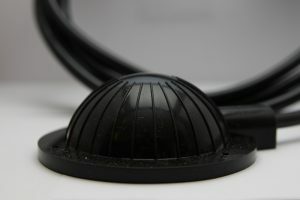 Made of flexible PVC. Standard black, with other colors available. Available with tubing or air spout. F800BA Circular shape, 5/16″ O.D.or 3/8″ O.D. B350BA Low profile 1/4″ O.D. or 5/16″ O.D. 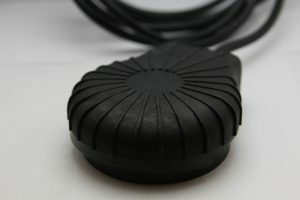 Electrical foot pedals are available with ratings up to 25 AMPS, 1 HP @ 120 VAC, 2 HP @ 240 VAC. Gold plated electrical contacts are available. Custom logos available.